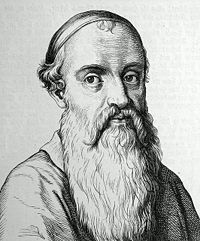 Menno Simons - wood engraving by Christoffel van Sichem, 1610. Menno Simons (1496 – January 31, 1561) was an Anabaptist religious leader from Friesland (today a province of The Netherlands). His followers became known as Mennonites. 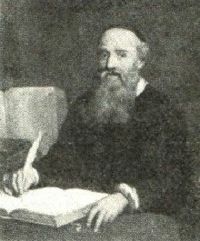 Against the reputation that Anabaptists had earned for disrupting society and for violence, Menno Simons was a man of peace. Although small in number, the movement he inspired has made a major contribution to aid, development, poverty relief and the worldwide struggle for peace and justice. Heirs to Menno Simon's legacy, whether formerly affiliated to the Mennonites or outside this community, tend to engage in what has been called Christianizing the world, that is, restoring God's spoiled and broken creation to resemble more closely the world of justice and peace he intended it to be. The New Jerusalem, Menno Simons believed, could be built by morally regenerated women and men who shun evil, embrace the good and allow the Holy Spirit to work through them to fulfill God's redemptive task. His legacy has lived on in Mennonite championship of pacifist principles and in the Baptist championship of religious freedom. Menno Simonszoon (Simon's son) was born in Witmarsum, Westergo, Friesland. Friesland was ravaged by war in the late fifteenth and early sixteenth century. Landsknecht soldiers haunted the Frisian lands in the 1490s to force the 'Free' Frisians to accept the duke of Saxony-Meissen as their head-of-state. The duke was the governor of the Netherlands for the Habsburg family. One of the archenemies of the Habsburgs, the Duke of Guelders invaded Friesland in 1515 and conquered half of it. The other half was ceded by Saxony to the Habsburgers. The Frisians tried to regain their freedom but they were too weak and eventually accepted the imperial authority of the Habsburg emperor Charles V. Simons grew up in this disillusioned and war torn country. Very little is known concerning his parents or his childhood. He was of poor peasant parentage, and his education was limited to his training to become a priest. Ordained as a Roman Catholic priest in 1524 at Utrecht, he was then made a chaplain in his father's village Pingjum. Around 1526 or 1527, questions surrounding the doctrine of transubstantiation caused Menno to begin a serious and in-depth search of the scriptures, which he confessed he had not previously studied, even being a priest. At this time he arrived at what some have termed an "evangelical humanist" position. Menno's first knowledge of the concept of "rebaptism," which he said "sounded very strange to me," came in 1531. This came through the means of hearing of the beheading of Sicke Freerks Snijder at Leeuwarden for being "rebaptized." A renewed search of the scriptures left Menno Simons believing that infant baptism is not in the Bible. He discussed the issue with his pastor, searched the Church Fathers, and read the works of Martin Luther and Heinrich Bullinger. While still pondering the issue, he was transferred to Witmarsum. Here he came into direct contact with Anabaptists, preaching and practicing adult baptism. Later, some of the Münsterite disciples came there as well. While he regarded them as misled and fanatical, he was drawn to their zeal and their view on the Bible, the Church, and discipleship. When his brother Pieter was among a group of Anabaptists killed near Bolsward in 1535, Menno experienced a spiritual and mental crisis. He said he "prayed to God with sighs and tears that He would give to me, a sorrowing sinner, the gift of His grace, create within me a clean heart, and graciously through the merits of the crimson blood of Christ, he would graciously forgive my unclean walk and unprofitable life…"
Menno Simons rejected the Catholic Church and the priesthood in January of 1536, casting his lot with the Anabaptists. His date of baptism is unknown, but by October of 1536 his connection with Anabaptism was well-known. In that month Herman and Gerrit Jans were arrested and charged with having lodged Simons. He was probably baptized not long after leaving Witmarsum in early 1536. He was ordained around 1537 by Obbe Philips. Obbe and his brother, Dirk Philips, were among the peaceful disciples of Melchior Hoffman (the more radical having set up the kingdom in Münster). It was Hoffman who introduced the first self-sustaining Anabaptism to the Netherlands, when he taught and practiced believers' baptism in Emden in East Frisia. Anabaptists took their name from their refusal to accept the validity of infant baptism, which meant that they practiced what was called ana, second baptism. They also tended to reject imposition of creeds as a sign of orthodoxy and to favor self-governing congregations. There was, however, among many of them also a strong sense of community. Located at what is referred to as the radical end of the reformation, they gained a bad reputation due to the excessive zeal of such men as Thomas Müntzer, beheaded in 1525, to establish God's kingdom on earth with the sword, if no more peaceful means prevailed. Behind this over-zealousness was the conviction that once saved by God's grace, a truly moral life could be lived here on earth. One consequence of this theology, among some Anabaptists, was a greater emphasis on what has been called sanctifying or even Christianizing the world than on trying to persuade individuals to embrace Christianity as a personal faith. The true Christian lives a life that is discernibly different from that of the unbeliever, who are unregenerated. If a believer's life resembles that of the unbeliever too closely, Menno Simons taught, he cannot be considered truly reborn. This included living a life that was too worldly, too rich, too materialistic. The group of Anabaptists who gathered around Menno Simons in Holland and North Germany, sometimes called the Obbenite anabaptists, were, as was he, pacifist. Their vision of Anabaptist life was of "Christians as little pacifist house churches, refusing to christen infants." For Simons, the new Jerusalem could be built here, now, by human hand. By 1544, the term Mennonite or Mennist was used in a letter to refer to the Dutch Anabaptists, and these emerged as modern day Mennonites, of whom there are about one and a half million in the world. Instead of stressing evangelism as proclamation, they have emphasized service. Through the Mennonite Central Committee, an international aid, relief and development agency, Mennonites have been in the forefront of poverty alleviation, disaster response and peace and justice activism. Volunteerism is an important principle. The house where Menno Simons is believed to have worked. Twenty-five years after his renunciation of Catholicism, Menno died at Wüstenfelde, Schleswig-Holstein, and was buried in his garden. He was married to a woman named Gertrude, and they had at least three children, two daughters and a son. Menno Simons influence on Anabaptism in the Low Countries was so great that Baptist historian William Estep suggested that their history be divided into three periods: "before Menno, under Menno, and after Menno." He is especially significant in coming to the Anabaptist movement in the north in its most troublesome days, and helping not only to sustain it, but also to establish it as a viable Radical Reformation movement. In the early seventeenth century, John Smyth (1570-1612), a former Church of England clergyman and a group of Christians fleeing religious persecution in England, settled in Amsterdam. There, they became convinced that baptism should follow a mature affirmation of faith, and became Anabaptists. When Smythe subsequently encountered the Mennonites, he realized that there were already communities of properly baptized Christians, and he regretted having baptized himself (he did so, then baptized his congregation). Menno Simons by Ludwig Bechstein in Leipzig, 1854. Smythe became a Mennonite. Others, under the leadership of Thomas Helwys (1550-1616) later returned to England, forming the first Baptist congregation there in 1612. The early English Baptist continued to communicate with the Dutch Mennonites and most Baptist still claim a family relationship with the legacy of Menno Simons. Helwys wrote the first plea in English for religious liberty but died in prison for his convictions. This also suggests Simon's legacy. Although Simons did not produce a treatise on religious liberty, he continually admonished the Dutch authorities to allow religious freedom, writing that,” to throttle the “truth” and to defend “lies” “with the sword” is not the way of Christ." Baptists have not an unblemished pro-peace record but they have been consistent champions of religious freedom. Jacob Amman (c. 1656 – c. 1730) was a Swiss-German Mennonite who from 1693 led a break-away group, arguing that the Mennonites had strayed from Menno Simon's teaching. One issue on which he departed from the majority of Mennonites surrounded the practice of "shunning," or of "sending to Coventry" members who were considered to have broken their covenant. This practice had died out and he wanted to revive it. In the 18th century, Amish started to settle in Pennsylvania in the United States where they practice a traditional life-style. Their avoidance of modern technology stems from their theology of living in but not of the world, as a sanctified and separate, distinct community. "The regenerated do not go to war, nor engage in strife. They are children of peace who have 'beat their swords into plowshares and their spears into pruning forks, and know no war' (Isaiah 2:4, Micah 4:3)...Our weapons are not weapons with which cities and countries may be destroyed, walls and gates broken down, and human blood shed in torrents like water. But they are weapons with which the spiritual kingdom of the devil is destroyed...Christ is our fortress; patience our weapon of defense; the Word of God our sword...Iron and metal spears and swords we leave to those who, alas, regard human blood and swine’s blood of well-nigh equal value." "We who were formerly no people at all, and who knew of no peace, are now called to be...a church...of peace. True Christians do not know vengeance. They are the children of peace. Their hearts overflow with peace. Their mouths speak peace, and they walk in the way of peace." ↑ Simons, Menno. Renunciation Menno.org. Retrieved January 16, 2008. ↑ Simons, Menno. "The New Birth.” Scroll Publishing. The New Birth Retrieved January 16, 2008. ↑ "Advocates of Religious Freedom: Menno Simons." Advocates of Religious Freedom: Menno Simons Retrieved January 16, 2008. Krahn, Cornelius. Dutch Anabaptism: Origin, Spread, Life and Thought (1450-1600). The Hague: Martinus Nijhoff, 1968. Wenger, John C., ed. "The Complete Writings of Menno Simons." translated by Leonard Verduin and edited by John C. Wenger, with a biography by Harold S. Bender. Scottdale, PA: Herold Press, 1986. Menno Simons in "Global Anabaptist Mennonite Encyclopedia Online."